Crude oil prices took another hit Thursday, falling roughly 5% to $45.50 a barrel in midday trading -- some of its lowest levels in more than 16 months. On Oct. 3, February oil futures were trading near $76 a barrel. Now just over $46, we're talking about a near-40% beating, making the S&P 500's peak-to-trough decline of 15% look calm. Oil doesn't just impact OPEC, gas station prices and futures traders. It has far-reaching implications for corporate earnings as well. While many of these companies can lock in oil prices by selling futures contracts at higher prices, most companies do not lock in all of their production. And while many U.S. producers have done a great job at reducing production costs and increasing various efficiencies, the bottom line is that falling oil prices hurts profits. First, consider ETFs like the Energy Select SPDR ETF (XLE - Get Report) or the Vaneck Oil Services ETF (OIH - Get Report) . The two are down 24% and 43% so far this quarter, respectively. That's obviously weighed on individual equities, too. Exxon Mobil (XOM - Get Report) , the sector's largest company, has fallen more than 16% in the last three months. Chevron (CVX - Get Report) is one of the better performers, down "just" 9.8% over the same period. Others have fared far worse, with Occidental Petroleum (OXY - Get Report) and EOG Resources (EOG - Get Report) each down more than 20% and Schlumberger (SLB - Get Report) tumbling almost 40% in the last 90 days. Schlumberger is a holding in the Action Alerts PLUS portfolio, although the portfolio's far larger holding, BP plc (BP - Get Report) , is fairing much better, down 14% over the last three months. There's no simple way to put it. Those with a diverse portfolio and exposure to the energy sector are feeling the heat. But it can extend even further than that. For instance, while consumers enjoy a lower price at the pump, it results in lower revenue fees for companies like Visa (V - Get Report) , MasterCard (MA - Get Report) and American Express (AXP - Get Report) . Then there are the companies that benefit from falling oil prices. Even though cruise ship operators like Royal Caribbean (RCL - Get Report) and Carnival Corp. (CCL - Get Report) have been struggling like the rest of the market, their operating costs should decline. The same can be said for airline operators like Delta Air Lines (DAL - Get Report) , United Continental (UAL - Get Report) and American Air (AAL - Get Report) . There are so many different facets to the oil market that many investors may not initially realize. But know that the ~40% beating the commodity has suffered this quarter is going to make a notable impact going forward. Save 66% with our '12 Days of Holiday Deals' Sale. Join Jim Cramer's Action Alerts PLUS club for investors and get our best deal of the year. Click here for details or to sign up. BP and Schlumberger are holdings in Jim Cramer's Action Alerts PLUS member club. Want to be alerted before Jim Cramer buys or sells BP or SLB? Learn more now. 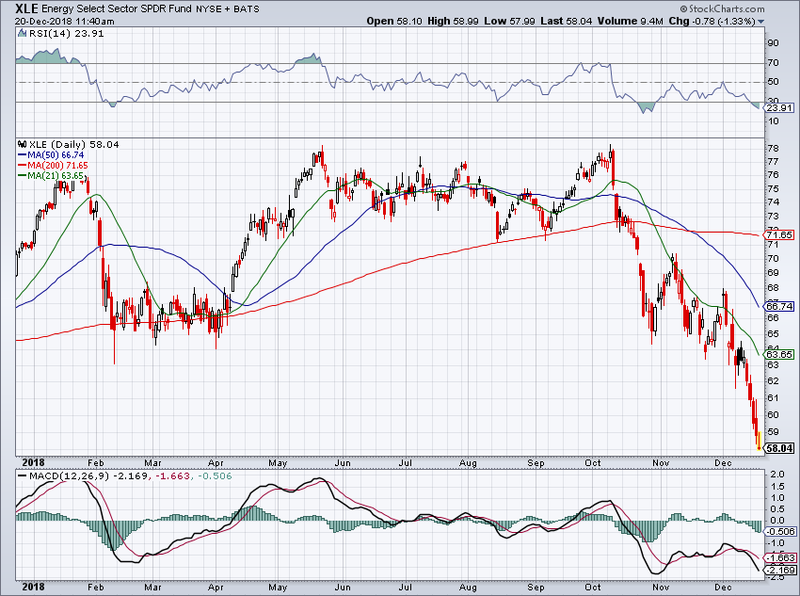 The Energy Select Sector SPDR ETF has been hammered to new 52-week lows this quarter.